The Equestrian Employers Association (EEA) has added a Scottish template to its innovative online Contract Creator, to comply with Scottish and Northern Irish employment law. The slick five step easy-to-use employment contract creator is a legal document, suitable for all staff employed in Scotland, and is required by law. A recent survey identified that approximately 57% of the 1,300 grooms which took part are employed illegally and do not have a written Statement of Particulars (aka written contract). Highly concerning is also the number of grooms that are employed and then ‘told’ that they are self-employed; this is extremely illegal and is tax evasion and would result in large HMRC fines if prosecuted. The ramifications for these employees is significant as it means that all their employment rights are non-existent. 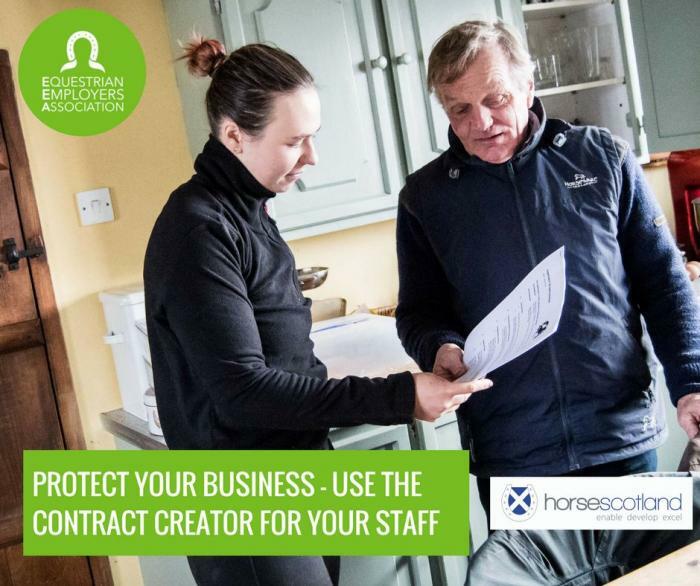 The Contract Creator is a free to use tool for all employers signed up to the Equestrian Employers Association, have a look here.